Cardamom is the quintessential flavor of the holidays in Scandinavian countries. I hadn’t used it much before moving to Minnesota, where Swedish and Norwegian baking is part of the fabric of this community’s tradition. It is also the perfect spice for pears, which have such a subtle flavor and absorb the intense spice when poached. I started with very firm pears and poached them slowly, so they would take on as much of the cardamom poaching liquid as possible. After the pears were poached to the point of just succumbing to the tines of a fork, but not too soft as to be mushy, I put them in a cardamom and orange cake batter, that I adapted from a Bake from Scratch recipe. When I put the pears into the batter they want to slump into the cake and bake under the surface. I did a little MacGyver engineering and secured them upright in the pan, so they would be standing straight when they came out of the oven. I must say that I was pretty pleased with the results. Recipe below. Pear ginger cake is the quintessential fall cake. 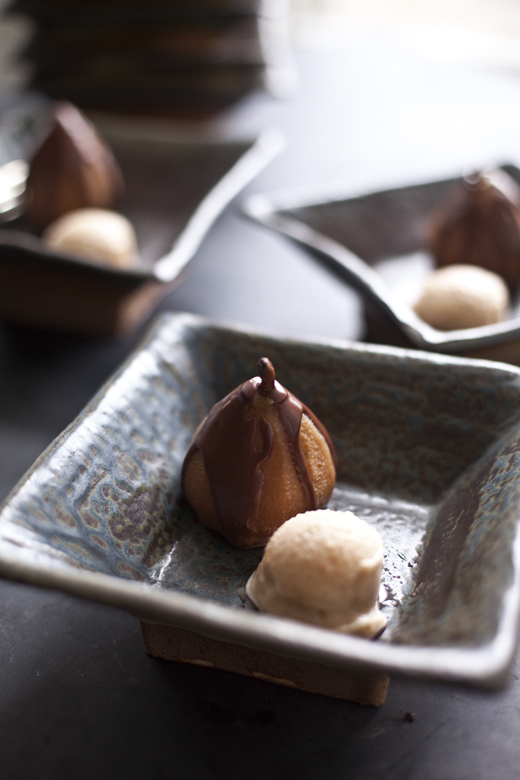 Poached pears were the symbol of a sophisticated dessert when I was a kid. Not that we ever had them, but I saw them standing tall on the pages of Gourmet magazine and always thought how magical it would be to eat something so beautiful. They’re just so elegant and complex and generally boozed up with wine. I poached these in a chai tea cider mixture and they are just as satisfying without the buzz. The cake is spicy with a kick of freshly grated ginger and tons of warm spice from cloves and cinnamon. It’s by no means an overly sweet cake, which is how I like them. The molasses gives it color and that edge of bitter that I love. I’ve made it using more molasses and I love it, but I mellowed it down by adding some brown sugar to the mix. I think this is a perfect Thanksgiving dessert! This is the perfect dessert for Thanksgiving dinner. It can be made days ahead, doesn’t require any oven space and is decadent with flavor, but light enough to follow your Thanksgiving feast. The poaching liquid is homemade chai; a blend of sweet spices and black tea. Once the pears are finished poaching, the liquid can be chilled in an ice cream maker to serve as sorbet. A drizzle of chocolate ganache gussies up the dessert and makes it look like something you fussed over, even though this is one of the easiest desserts to create. No one needs to know that!